With the hype about chatbots, the rumour mill has been in overdrive. We’ve heard it all: From statements such as “You can build your bot within an hour” to “Chatbots will be causing an immense job reduction”. 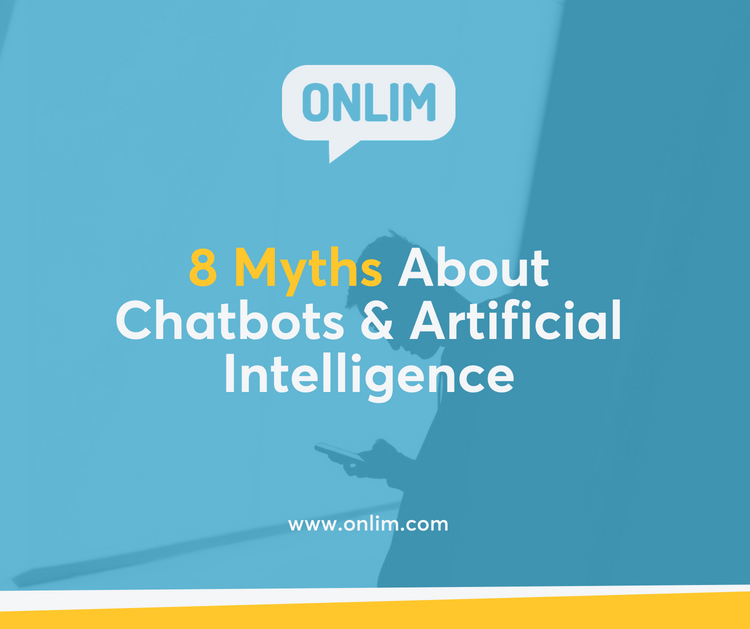 In this article, we want to shed some light on the most common myths about chatbots and Artificial Intelligence so that you are well informed for your next discussion about chatbots, AI and co.
1.Chatbots have only been around for a short while. Have you ever heard of ELIZA? ELIZA is one of the most well-known chatbot therapists with whom you can talk about your problems – and the bot was created about 50 years ago. In 2010, Apple’s virtual assistant Siri became famous, followed by other virtual assistants such as Google Assistant or Cortana. Today bots are already part of everyday life, but they are not a new invention. Here some more details on the history and development of chatbots. 2. Only large companies use chatbots and AI. AI is already part of many areas of our daily lives. Whether it’s the current weather forecast or a warning message from your bank about a suspected fraud. All these applications use artificial intelligence. This list of AI tools shows a wide range of use cases. Chatbots are becoming more popular, too. Be it through the virtual assistants in your smartphone or bots used in corporate communications. Thus, not just big companies are using chatbots and AI. There are also many tools and vendors that make it affordable for small businesses. For example, here’s an overview of free tools for creating chatbots. 3. You can build a chatbot in no time. Well, it may be easy to set up a bot quickly, but: Whether this chatbot really helps your customers and is easy to use is a totally different thing. The implementation of a successful chatbot project requires a lot of planning and research in advance. First, you’ll need to understand the needs of your target audience and what problem your chatbot should solve for them. Once the bot has been created, you have to take care of promoting your chatbot effectively. As you can see, a lot of tasks that need to be dealt with. If you need help with the implementation, feel free to reach out to us. We will help you with the implementation of a customized chatbot in a structured and strategic way. 4. Chatbots can only support customer service. The most common use case for chatbots is answering customer requests. But the applications of chatbots are not limited to tasks related to customer service. For example, another great use case is the support at events. In fact, there a lot of different use case in areas such as Sales or HR. You can find some more examples in this article. A common fear is that chatbots and AI will destroy jobs. However, only a few take into consideration that new jobs are created at the same time. Additionally, Chatbots and AI can take care of monotonous and often time-consuming tasks your staff has to deal with. This will give them more time to take care of really important tasks. Chatbots and AI will definitely change the tasks we are responsible for as a human. But human labour will not become redundant. 6. All bots use AI. Not all chatbots are based on an AI. Generally, there are two types of chatbots: rule-based and AI-based. A rule-based chatbot is provided with a list of set answers for the most common questions. For example, if a user asks question X, the chatbot will answer Y. AI-based bots, on the other hand, learn independently and can also adapt the way they responds based previous interactions. Another term that is commonly used in this context is: Natural Language Processing (NLP). NLP is a subset of AI and allows chatbots to understand the user request by analyzing the context. Chatbots that do not use NLP are keyword-based. That means, they search for keywords within the user request and compare them to a previously defined keyword list to select the appropriate answer. 7. Robots and AI are the same. When talking to a chatbot, it’s usually easier for us to imagine a human-like robot at the other end of the chat window. But robots and AI are two different things. Robots are programmable machines. AI, on the other hand, is a program that uses algorithms to perform tasks that usually require human intelligence. Of course, there are also robots that are equipped with AI. However, AI does not necessarily need a “body”. 8. AI has a consciousness. For some users, it may be unfamiliar or frightening to talk with an Artificial Intelligence. Numerous films like “AI”, “Her” or “I, Robot” create scenarios of robots with a consciousness that, at worst, want to rule the world. Well, this is a very exciting story for a Hollywood movie. However, it has little to do with reality. An AI that has a consciousness does not exist and is unlikely to be created in the near future. At least, if you believe leading AI scientists.